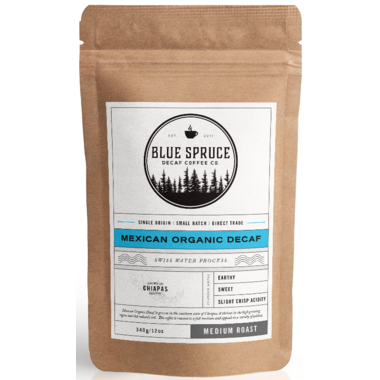 Mexican Organic Swiss Water Decaf is grown in the southern state of Chiapas, it thrives in the high growing region and rich volcanic soil. This coffee is shade grown without the use of pesticides or fertilizers and is roasted to a full medium which appeals to a variety of palettes. My favorite part of this coffee company is that they specialize in decaf coffee. What you do.....do well & they certainly do that. A full flavored dark coffee. I drink it daily and do not miss the caffeine. Well done Blue Spruce!! The coffee has a rich flavor and does not taste like decaf. This is the best decaf coffee I have ever tasted, so smooth and flavorful.